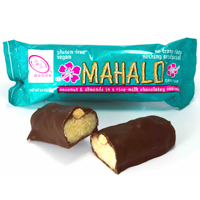 A bite-size version of the delicious organic OCHO Coconut Bar! Great ratio of chocolate to coconut! The perfect little snack! And it's vegan! Ingredients: Organic dark chocolate (organic cacao beans, organic evaporated cane sugar, organic cocoa butter, sunflower lecithin (emulsifier)), organic tapioca syrup, organic coconut, organic sugar (organic cane sugar, organic tapioca starch), water, sea salt, organic soy lecithin, and organic vanilla extract. From the package: Made on shared equipment that processes peanuts, tree nuts, milk, and eggs. May contain peanuts. Contains tree nuts. Vegetarian info: This item is certified vegan by Vegan Action. I used to love the coconut milk chocolate bars found in local stores, you know, the ones with all the junk in the ingredient list. But when I found these, there was no going back! Chewy coconut with sweet melk chocolate and no guilt! I got a sample bar (...) and was so glad to see it here! The coconut was the closest thing I've had to the coconut Easter eggs my uncle used to make, only these are VEGAN!!! I'm in love!